For 2015, TerraVelo Tours is offering dedicated family tours in Wyoming and in California, welcoming children as young as 8. TerraVelo Tours, offering fully-inclusive luxury mobile tent camping travel for both avid and casual cyclists has just announced 2015 seven-day itineraries, which expand beyond their initial Utah tours to add journeys through Wyoming and Northern California. Wyoming Mountains, Geysers and Bison cycling tours include stops at Grand Teton National Park , Jackson, Yellowstone National Park including Old Faithful, Norris Geyser Basin, the Hot Springs Loop, the unique landscape of Mammoth Hot Springs and the Lamar River Valley. Tours depart late June-July, and early-mid September. The California Oceans, Vineyards and Redwoods tours encompass stops at Point Reyes National Seashore, Santa Rosa, Sonoma , Napa, Armstrong National Redwoods Preserve, Salt Point State Park, sunrise yoga followed by a cycle through the Avenue of the (Redwood) Giants, and an optional ride up the “Lost Coast.” Departures are late May-June and August. Guests will be outfitted with a rental carbon fiber specialized Roubaix Expert Ultegra or similar high-end carbon fiber road bike and helmet; those preferring to ride their own bike can simply bring it to their local bike shop where TerraVelo will have it shipped, delivered and assembled, ready to ride when the guest arrives, and shipped back to the bike shop upon departure. Each of the luxury tents simulates an upscale hotel guestroom, outfitted with Tempur-Pedic mattresses; Frette linens; down comforters; rugs; furnishings from ABC Home & Carpet and Mitchell Gold +Bob Williams; Turkish bath towels; and Molton Brown toiletries and sundries. 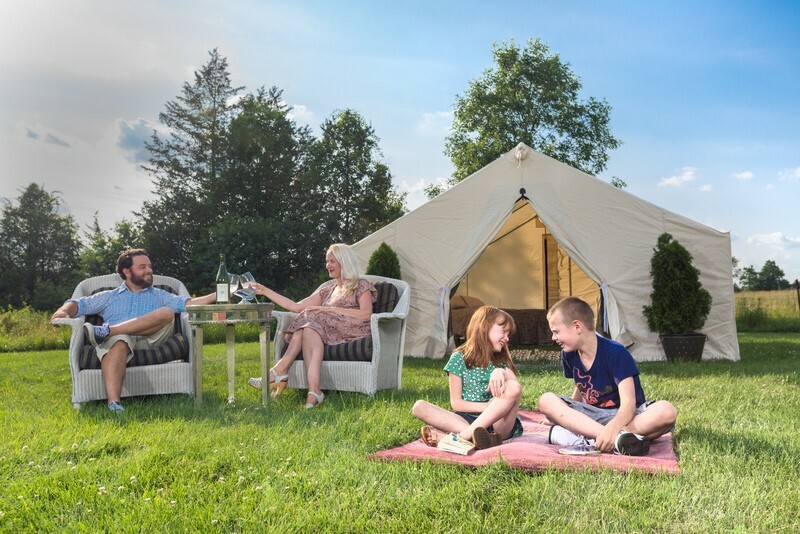 Each night’s Camp will include: a full-time personal chef and sous chef who will prepare all meals; a dining tent; sunrise yoga; laundry service; evening entertainment including live music and campfire. On two evenings, a masseuse will provide 30-minute massages; on other nights, guests will enjoy educational sessions from a visiting astronomer and/or geologist who will share insights on the gorgeous night sky, landscape and vegetation. A Lounge tent with a sofa, club chairs, board games including chess, backgammon, playing cards; books and a fully-stocked bar; shower and restroom facilities complete the mobile accommodations. The 7-day tour packages include all food, beverage, accommodations, and roundtrip airfare from the Continental United States. These exhilarating itineraries are $7,850 per person, double occupancy, with guests’ choice of one King bed or two singles. For 2015, TerraVelo Tours will host dedicated Family Tours in Wyoming and in California, welcoming children as young as 8. Parents and grandparents are encouraged to visit the TerraVelo Tours website and note the Family Focused tours scheduled in 2015, which feature designated children’s counselors; activities including movie night, cooking demonstrations and archery lessons for children and youngsters 8 to 15. Children’s rates are $5,850 with single bed accommodations in parents tents; youngsters 16 and over pay the adult rate. TerraVelo Tours provides the busy professional, avid cyclist, and lover of breathtaking scenery, with an all-inclusive luxury camping escape with bicycling, horseback riding, massages and other amenities available to create life-long memorable experiences. For more information or reservations visit www.TerraVeloTours.com or call 888-801-1446. For more information, visit www.terravelotours.com.